Today is National Best Friends Day. What a great thing to celebrate, right?? 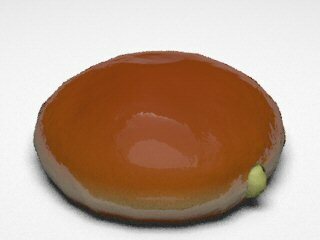 Today is also National Jelly-Filled Donut Day. As I posted on my Facebook wall, call up your best friend and head over to Krispy Kreme! It's a celebration! 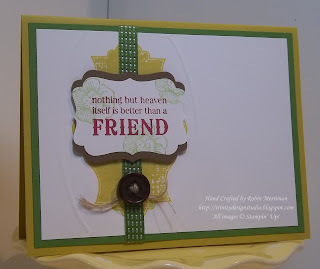 Kind of cool then that the card I'm sharing today is a FRIEND card, huh? 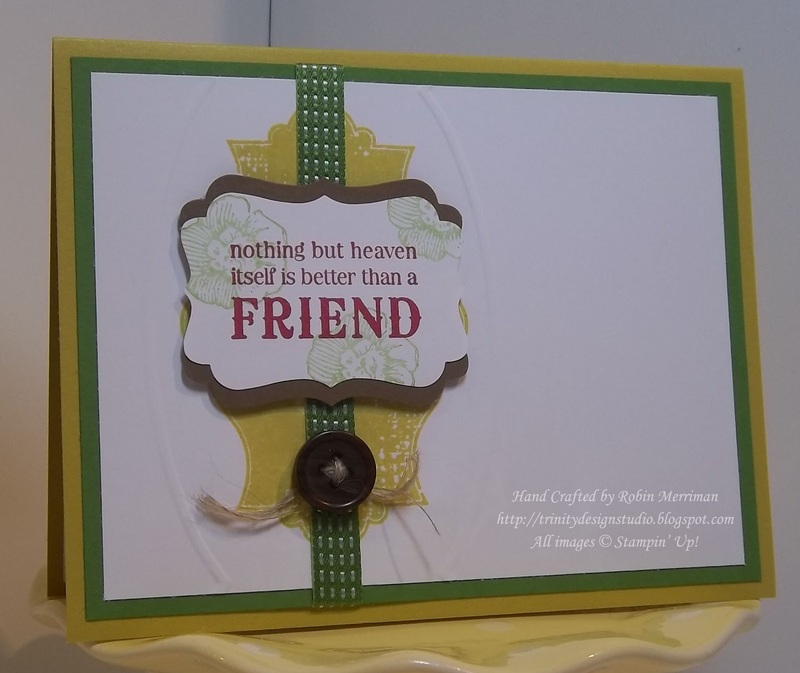 I created this at the beginning of May when I only had a few supplies from the NEW Catalog to work with. It's pretty clean and simple, but has some fun details too. The card base is the NEW In color Summer Starfruit and the green layer is also a NEW In Color, Gumball Green. I stamped the label image from Everything Eleanor onto Whisper White Cardstock in Summer Starfruit then used my Edgelits and the Big Shot to create raised brackets around the image. The ribbon is the new Gumball Green stitched satin and I've topped it off with new Naturals Button and some Linen Thread. The greeting comes from Blessings from Heaven and is stamped in Raspberry Ripple, another NEW In Color. It was punched out with the Decorative Label Punch and layered on another punch of Soft Suede that was cut in half to create a frame. A few Stampin' Dimensionals and you can call this one done. It's the Glazed Lemon Filled from Krispy Kreme and yes, I'm drooling a little just looking at the photo. Gotta save a few bonus points and go get one soon!